"The Defenders" is so close we can taste it. 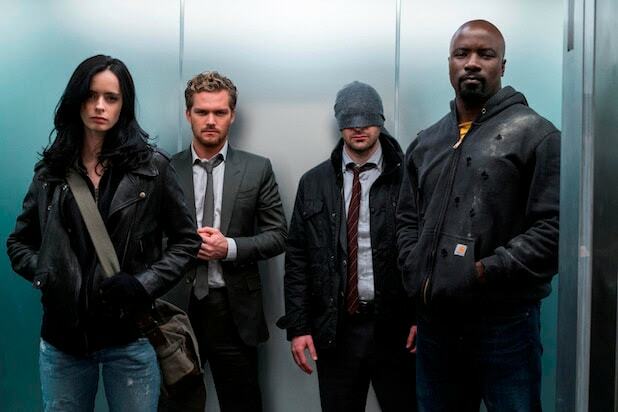 We can't wait to see how the four street heroes currently on Netflix -- Daredevil/Matt Murdoch (Charlie Cox), Iron Fist/Danny Rand (Finn Jones), Jessica Jones (Krysten Ritter) and Luke Cage (Mike Colter) -- will team up and who they'll take down. From the pics we see some new characters and some old favorites (and villains). Here's wait we're taking away from the photos ahead of the show's release, August 18 on Netflix. 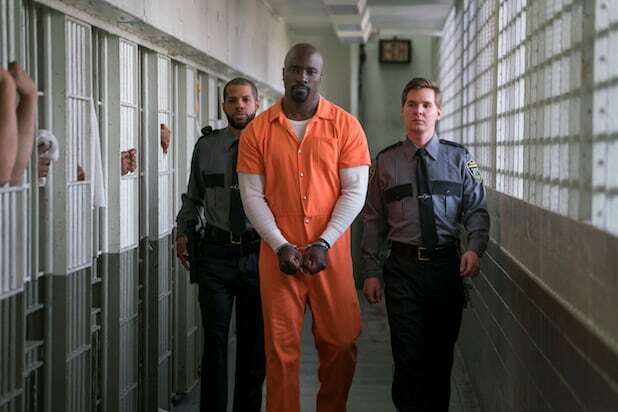 Luke CageLuke (Mike Colter) is getting out of the slammer -- which might be obvious, because you see Luke in the trailer. But someone from another Marvel show (hint: he's on "Daredevil") is there to meet him upon release. AlexandraSigourney Weaver plays the mysterious villain, pictured here with Madame Gao (Wai Ching Ho), a familiar villain from both "Daredevil" and "Iron Fist." They appear to be working together here... but will their alliance last? Elektra's Back, B------!And she's sleepy as hell. Just kidding, the powerful ninja played by Elodie Yung is just formerly-deceased. She's back from the dead, thanks to the mysterious order Alexandra is in charge of. Even Defenders Gotta EatFighting an ancient crime organization that trains lethal ninjas is hard work, and there's nothing like some late-night Chinese food to re-up after a battle. Especially when you're trying to convince three other highly independent superheroes that it's a good idea to team up. Nelson and Murdock, Attorneys at Law reunion!In "The Defenders," many of your favorite supporting characters from the individual shows will return. Here, we see Foggy (Elden Henson) and Karen (Deborah Ann Woll), Matt's estranged BFFs, looking equal parts confused, annoyed and ready to take legal action. Claire TempleThe fan fave character played by Rosario Dawson returns to bring all the realness to her superhero beaus and friends. Claire is a huge glue stick that brings the four Defenders together. Stick Still Looks UnhappyScott Glen plays the man who trained Matt Murdoch and Elektra, and he's back with some seriously needed intel on The Hand, the ancient crime order both Daredevil and Iron Fist oppose. Misty KnightThe badass Harlem police detective played by Simone Missick was introduced in "Luke Cage," and this time she's back to sniff out criminal wrongdoings throughout New York City. Will fans see their "Daughters of the Dragon" dreams come true? Superheroes -- They're Just Like UsNo matter your super powers, subway is still the cheapest and quickest way around New York City. Power Man and Iron Fist Meet for the First TimeHere, we see Danny and Luke facing off. We know the four heroes don't begin off the bat as friends... will these two powerful heroes be able to settle their differences and get along? (Public) DefendersFrom the trailer, we know Matt Murdock is going to represent Jessica Jones over some unspecified legal problems, but now we know she's being interrogated by Misty Knight. Hmmm, what did Jessica do this time? Elektra: Still DeadlyMaybe more than ever. Remember all that Black Sky business at the end of "Daredevil" Season 2? That's ultra important, as Elektra seems to be being used as a weapon for a certain evil organization. It's Morning Radio Personality Trish Walker!Jessica Jones' best friend Trish (Rachael Taylor) will also play a part in the Defenders' fight to protect New York City. Here, she and Jessica seem to be discussing something important... a new case, perhaps? Colleen WingThe former Hand apprentice has shifted allegiances before--will she stay loyal to Danny in "The Defenders?"